Silvia had a friend visiting from central Massachusetts on Sunday, and they were looking for a spot to go hiking that would be new for both of them. Silvia frequently hikes throughout the Plymouth area, but thought she would give the Wishbone trail a go, inside the Myles Standish State Forest. Using an trailfinder app, the two friends embarked upon the eight-mile journey. At about the six mile mark, crossing an overgrown path back to Bentley Loop, they discovered something very unusual—a large pine tree covered in Elmo dolls. Well....that's weird. Reminds me of that island of dolls. They all stand around tickling one another. Spend enough time hiking and backpacking, and you'll find lots of weird stuff like this deep in the woods. Hikers have a weird sense of humour. At the top of my island, there's a super remote route with a giant spruce on it, and the spruce is COVERED in shoes. Like thousands of shoes. People have been doing it for over a century. Hikers are a weird bunch. Here's a pic. 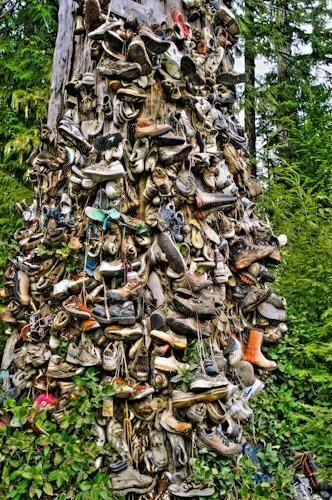 Google "Cape scott shoe tree" for more.